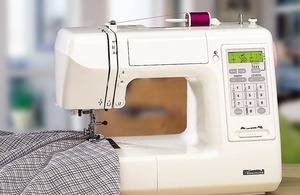 For a superb quilting experience - combines the convenience of computerized technology with all the features you need for quilting, heirloom sewing and home deco-sewing. Click HERE to watch an informative Consumer Alert on Singer and Brother "clam shell" manufacturing vs Kenmore Full Metal Castings. Hard cover, bobbins, needles, large and small spool caps, screwdriver, seam ripper, felt, additional spool pin, light bulb, lint brush, quilting guide. 167 stitches, including an alphabet and 5 one-step buttonholes provide all the stitches you need! I have a Kenmore sewing machine 19233 and it's been a great machine but getting some age. I might buy the same machine from you but before I do, can you recommend a machine that has the same features but does larger embroidery letters or is a better machine? Also, what features does the Janome DC 3050 have that the Kenmore 19233 doesn't? What makes it worth the extra money? The Kenmore 19233 and Janome DC5100 are exactly the same machines made by Janome in their Taichung, Taiwan factory.. You pay more for the Janome name primarily because the price is controlled through MAP, or minimum advertised online pricing. We recommend the Kenmore by Janome 19233 over any other Janome brand machine (including Elna and Necchi by Janome) because you get more features for the price from Kenmore brand. Hope this information helps.